How the Statue Was Built? Sadly, not everyone will have the opportunity to visit the Ellis Island Museum of American Immigration, and therefore will not experience the moving stories told within it's halls. The program that we offer is a window into the inner workings of what was a very pivotal time in the development of our country. 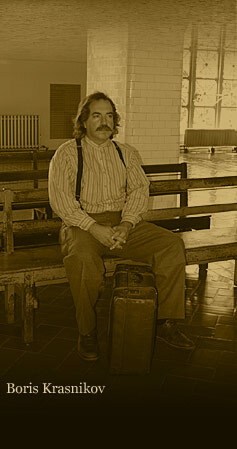 Diversity is what defines us as a people, and diversity was what flowed through the "Golden Doors" of Ellis Island. The history of the United States is a comparatively short one, but nevertheless an eventful one. By the time the Ellis Island facility came into service in 1892 immigration to the U.S. was at flood stage, and measures needed to be enacted to regulate that torrent. 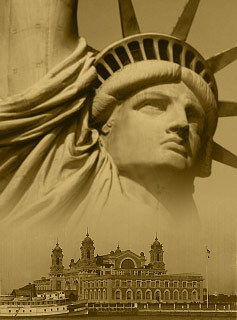 The year of 1892 saw Ellis Island service over 445,000 people hoping to become American citizens. Many Americans were not altogether pleased with this alarming influx, and pressured the government to place a number of restrictions on immigration in an effort to weed out the "unqualified" applicants. As should be expected health issues were of great importance. A battery of test was carried out, and a myriad of questions asked of each person in the vast lines that meandered through the Great Hall of Ellis Island. Most of these questions were merely ones asked by officials at the point of embarkation, repeated to see if the immigrant was telling the truth. Eyelids were folded back with a buttonhook like implement, checking for disease. Brief mental tests were administered. The immigrants were asked whether they had the required $25. Any discrepancies were accompanied with a specific chalk marking on their coat or blouse indicating the need for further questioning at another station. The Board of Special Inquiry heard many cases in dispute. The Board proceeding was not a criminal trial; it was considered an administrative function, and therefore no lawyers were allowed on the Ellis Island, let alone in the hearing room. People before the board were assessed as to their risk of becoming a "Public Charge". The board consisted of three members, two junior officers, and one senior officer. The junior officers would vote first in an effort to avoid any potential conflict of interest, and to avoid clashing with the senior officer's decisions. The senior officer voted merely to break any tie vote that may arise. The senior officer could vote for the record, but that was at his discretion. For the record there were no female board officers until many years after this case would have been heard. These proceedings were considered a very important component in the process of Ellis Island. The reenactment of The Board of Special Inquiry on Ellis Island is held in the actual boardroom of old, which has been restored to its early 1900s condition. The modern incarnation of the board, which draws it's members from the audience in attendance, proves to be a lively and informative interaction. The new board members are encouraged to expand on the list of questions given them. The audience is drawn into the action, and the whole experience is personalized in a way that could not be supplied by merely reading about it. The traveling Board of Special Inquiry is an interactive program that transports the group back to that day in time, making them a part of the event. Prior to the arrival of the performer the hosts are sent an informational package, preparing their group for the Board to be held at their site. Three persons will need to be chosen to act as the officers of the board, and a list of questions enclosed in the package will serve to guide them through the program. The responses of the performer will open the door to the unwritten questions between the lines. During the process the audience will have an opportunity to ask their prepared questions of the immigrant. The group’s questions are their chance to test the water, putting their concerns and curiosities into their own words and therein making the event their own. When the times comes for the board members to decide the fate of the immigrant the group will know they had been a fundamental part in that outcome. After all reasonable inquiries have been made the board members will then debate amongst themselves on the information they have gathered, and render a decision. Although this program is a great introduction to the inner workings of the immigration process, it best serves as the culmination of a course of study that has stressed the many aspects of American immigration. Although the structure of the Statue of Liberty is grand, the true grandeur can be found in the simplicity of its construction. A sublime simplicity. The process of Repousse is a journey of concept to fruition, of math and art, and had never been attempted on this scale before. I have a personal appreciation for the statues sculptor Frederic Bartholdi's dream. My great-grandfather was apprenticing in the tinsmithing trade in 1880's Upstate New York at the same time the Statue of Liberty was being built Downstate. In 1892, Dennis Heaphy, opened his own shop on the banks of the Erie Canal with a contract to make splash guards for the many carriages that filled the streets of his day. I am the fourth generation in that trade. Along with having the honor of being extensively involved in the ongoing restoration of the Statue of Liberty and Ellis Island, I have repaired and re-created historical monuments up and down the east coast. I am the main tinsmith for the Statue of Liberty and I demonstrate the art of Repousse for the public daily at it's base. While working on various projects in the statue I have paused to consider "What is a statue"? We commonly carve figures out of stone or wood, but no matter what image we place on the veneer, the material inside stays the same. The ancient Chinese philosopher Lao-Tzu said "We form our clay into pots, but it is the emptiness inside that holds all that we want". The Statue of Liberty is by far the largest hollow statue on earth. I demonstrate the process of Repousse on a more personal level. Students witness the inner workings of those days, and gain a greater appreciation for what these men went through to bring Mr. Bartholdi's vision to life. The skin of the statue had to be formed in separate components and then assembled. After the dimensions were determined, plaster molds were made in actual size. These mammoth representations, however impressively beautiful, were built merely for the next stage. The metal could not be shaped against these fragile molds, so opposite, inverted hardwood molds were made. The metalsmiths now had a durable, accurate, contrasting surface in which to hammer the copper sheets against. Upon completion of the hammering phase, these massive shapes were then heated, smoothed, and all the details of the eyes, the fingernails, the ears, etc. were worked in. The Lady Liberty has welcomed visitors, hopeful immigrants, and Americans returning home for over 120 years, and is one of the most recognizable icons in the world. Liberty Enlightening the World, or as we know it today, The Statue of Liberty was the concept and dream of the sculptor Frederic Auguste Bartholdi. Mr. Bartholdi can still be seen to this day wandering about on Liberty Island, and he will gladly rest awhile to sing the praises of his creation with passers-bye. Mr. Bartholdi loves to talk about his lady. Previous to the delivery of his masterpiece to America Mr. Bartholdi traveled extensively across the U.S. speaking of the upcoming dedication. If you would be interested in a visit by foremost authority on the Lady of Liberty, it can be arranged. The program usually lasts approximately thirty-five minutes per session, and there are usually two sessions per school visit. Package deals are available for schools in close proximity to each other. If you have any more questions please email me or call me at 212-465-3363.